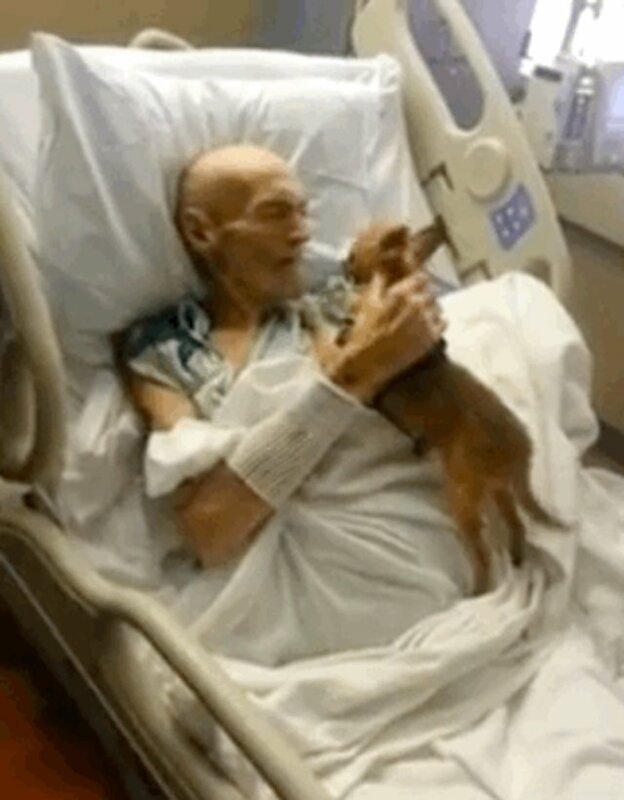 A hospital in Whitley County, Ky. is reassessing its pet visitation policy after seeing the remarkable good that can come when patients under their care are reunited with animals they had to leave behind. Not long after an elderly man named James Wathen was admitted to Baptist Health Corbin last month, his condition steadily began to deteriorate despite their best intervention efforts. As the weeks dragged on, Wathen started to show signs of emotional distress and he eventually stopped eating normally - but his caregivers soon learned that he needed more than just medical attention as he neared the end of his life. He needed his dog. When Wathen was sent to the hospital, he had been forced to say goodbye to his beloved pet, an aging one-eyed chihuahua named Bubba. And as his final wish, Wathen asked simply to see him one last time. Despite their no-animals policy, hospital workers quickly "pulled out all the stops" to track down the dog - and with the help of staff at the Knox-Whitley Animal Shelter, they were able to find him. The little dog had been placed with a foster family when Wathen fell ill, and just like his owner, he seemed saddened by the separation too. On Saturday, shelter volunteers and hospital staff worked together to grant Wathen his wish, reuniting the dying man with his dog. "When Bubba was handed to James, he started to cry and then Bubba started to snuggle James. It makes you realize that animals are not just pets, they are loved ones," the shelter wrote on Facebook. "Both are so happy to see each other and both seem to be doing better! The power of love can go along way!" But no one could have guessed what a difference the reunion would make. Chief nurse Kimberly Probus told The Dodo that since the visit, Wathen is more lucid and engaged, and overall is "definitely, definitely doing better." "He doesn't even look like the same man. I didn't expect the improvement to be this good," she says. "He had given up all hope of ever getting better without his friend, but once they got back together, I think they both now have a reason to live. It's amazing." Probus says that both Wathen and Bubba are eating normally again, and even the dog is visibly more positive. Wathen's condition is still unstable, but after seeing Bubba, death is no longer immediately imminent. "It would have been had we not come up with this solution," says Probus. The hospital has arranged for Wathen to start receiving regular visits from his dog, and has also decided to implement a new policy on animals that will allow other patients to get visits from their pets too. "Pets normally aren't allowed in hospitals because they're considered less clean," says Probus. "That thinking has changed in the last decade or so, but our hospital did not have a pet visitation policy at all. We're going to change that this week. We are ethically bound to meet the emotional needs of our patients, so we have to allow it when we can." In recent years, health professionals have begun taking a closer look at how dogs and other pets can raises a sense of well-being. 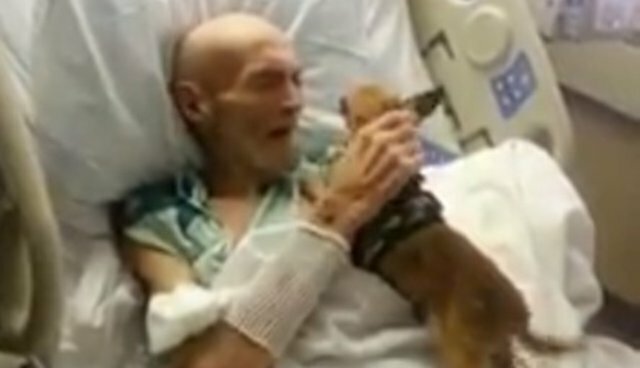 Research has found that these interactions with animals in medical settings help alleviate anxiety and stress, benefits which could potentially improve patient outcomes.